For the third straight year, the Zion United Church of Christ in Delaware will open its doors this winter to provide homeless men in the community with a warm place to sleep. Located at 51 W. Central Ave. in the church’s basement, A Place of Warmth shelter has been helping to get homeless men out of the cold since the 2015-2016 winter season. The warming center is open to homeless men from 8 p.m. to 8 a.m. on evenings when temperatures are forecasted to drop to 20 degrees or colder. “We are here to help make sure people don’t freeze to death,” said Mike Newcomb, site coordinator and Zion UCC member. According to Newcomb, the shelter — capable of housing up to eight men a night — was open 22 nights during the first year with at least one man using the service 21 of those nights. Last year, however, the shelter was open 25 nights, but it was only occupied nine of those evenings. Newcomb added that A Place of Warmth has been operating since day one on the initial pot of funds donated by community members and a handful of local companies and organizations: United Way of Delaware County, Delaware-Morrow Mental Health & Recovery Services Board, Consolidated Electric, Delaware City Vineyard, and CoBank. Along with financial support from area organizations, the shelter also relies on volunteers — coordinated by the Connections Volunteer Center in Delaware — to help man the shelter. Newcomb said in addition to community volunteers, the shelter is also staffed by a paid, off-duty officer. Anyone 18 years or older who would like to volunteer to help at A Place of Warmth must undergo training through Connections, which will hold its next training session for new volunteers at 7 p.m. on Thursday, Dec. 7 at the Zion UCC. The session also serves as a refresher course for past volunteers. Along with providing a warm place for homeless men to sleep during the coldest of nights, Newcomb said, the shelter does its best to make sure every man has dinner, breakfast, and a snack bag to take with them. Each man is also provided with a bed roll, which is theirs to keep. 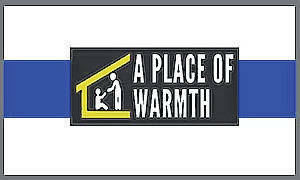 Individuals wishing to make a monetary donation to A Place of Warmth can do so through the Andrews House, a non-profit community services center that serves as the warming center’s fiscal agent. Donations may be sent to Andrews House, 39 W. Winter St., Delaware OH 43015. Newcomb confirmed A Place of Warmth will open for the first time this season on Thursday evening since temperatures are predicted to fall below 20 degrees late Thursday into Friday morning. AccuWeather is calling for a mix of clouds and sun on Friday with a high of 31 degrees and a low of 21 degrees. As for the weekend forecast, snow is possible on Saturday with a high of 30 degrees and a low of 18 degrees, while mostly cloudy skies are predicted for Sunday with high and low temperatures of 30 and 23 degrees, respectively.